Orlando Avenue Blog » Blog Archive Easy Halloween Decorations! Halloween is quickly becoming the most popular holiday in the US. In 2017, the National Retail Federation projects that Americans will spend a whopping $9.1 billion, with $2.7 billion alone on candy. You don’t have to break the bank for decorations, though. There are many ways you can prepare for the fun-filled holiday with inexpensive, everyday items. Save gallon milk jugs, and wash them out thoroughly. Use permanent black marker to draw ghostly faces on the sides, then add a few rocks or marbles for stability. Place a string of battery-powered LED lights inside, and place the jugs along your walkway or steps for a ghostly path to your door. Wrap white crepe streamers around your front door mummy-style. Cut two big eyes from white and black construction paper, and tape them to look like they’re peeking out of the strips. Instant spooky! Pumpkins are cheap and plentiful this time of year. Using child-safe carving kits, have the kids get in on the fun of carving a jack-o-lantern. Pumpkin Lady has over 700 free templates to download and print. Use black construction paper to cut out basic ghost figures, bats, owls or cats. Tape them to your windows, and when the lights are on at night, the silhouettes can be seen from outside. Make it look like specters are watching over your yard. Keep a few paper towel or toilet paper roll tubes. Carefully using scissors, cut different eye shapes in them. Tape glow sticks inside the tubes, and hide them in your shrubs and bushes. Grab a straw wreath, a few bags of faux spider webbing and plastic spiders at your local dollar store. Wrap the wreath with the webbing, and criss-cross a few strands across the middle for a cobweb effect. Hang or hot glue the spiders in different places around the wreath, add a Halloween bow, and hang on your front door. White tights can be repurposed as spider eggs. Cut the tops off, leaving the legs open. Add a baseball or softball to the toe, and glue or hot glue plastic spiders to the “sac.” Hang the eggs from trees (away from walking areas) or light fixtures for a really scary look. Make some ghostly guests out of unused tomato cages. Turn them upside down, and push a large styrofoam ball down onto the ground wires. Add lights around the cage, and drape a piece of white cloth or old sheet over the cage. Add plastic snakes, spiders and insects purchased from a dollar store to your welcome mat. 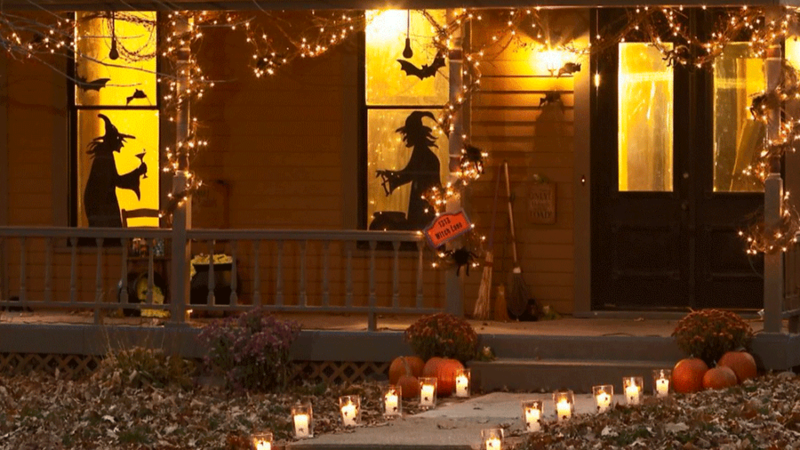 Spooking up your yard for Halloween doesn’t have to cost a great deal. Whether you want frightening or fun, decorating with household or inexpensive dollar store finds can be a family project. When the big night arrives, make sure you have plenty of candy, turn on your porch light, play some creepy music, and enjoy the evening.